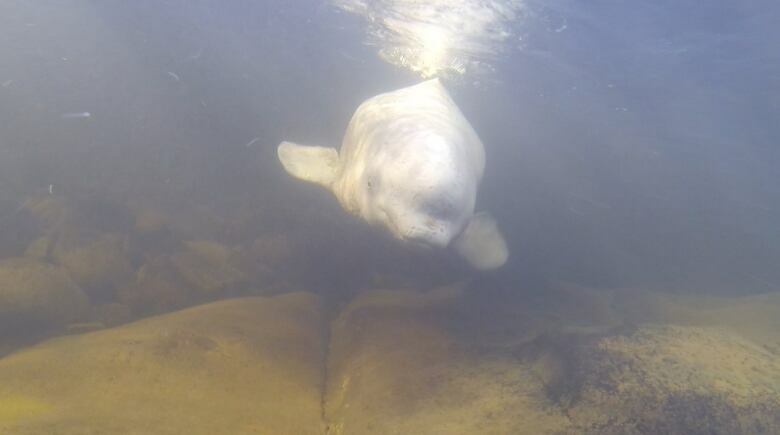 A beluga whale that charmed its way into the hearts of Nova Scotians earlier this month turns out to be the same one that made headlines last year after getting stuck in the Nepisiquit River in northern New Brunswick. According to the Marine Animal Response Society, the beluga, subject of a one-of-a-kind rescue last June, looks healthy. "It looks good, it's in very good shape, which made everyone happy," said Tonya Wimmer, executive director of the society. The male whale first drew the public's attention when it swam into the Nepisiquit River near Bathurst and became trapped when water levels dropped, leaving the water too shallow for an escape. Being a "vagrant" swimmer, the whale is believed to have once been a member of the larger beluga community that inhabits the St. Lawrence Estuary but is suspected to have left the pod and moved off on its own. After the whale was carried ashore from the Nepisiquit, rescuers flew the mammal to Quebec in hopes it would rejoin the pod. "That had never been done before," Wimmer said about the reintroduction. "It was always a question about these vagrant animals, if that's even possible." Wimmer said it's also been theorized that these wandering whales might just be following their natural instincts and don't need to be relocated. According to marine biologist Robert Michaud, who led the rescue in New Brunswick, it was an intense operation. "It was a lot of effort to save and learn from one single individual," he said. "The animal was not in super good condition." Seeing the whale he helped rescue swimming near the coast of Nova Scotia caused a mix of emotions. "First my reaction was, 'Whoa, this is amazing,'" he said. "Then it was, 'Oh no, what is he doing in Nova Scotia?'" Part of the reason for taking the beluga to the St. Lawrence River, Michaud said, was that the Quebec beluga whale population is endangered and declining. Any one individual could be key to survival, he said. Not only that, it seems the "vagrant" was now travelling with a friend. "We do not know who is this friend?" he said. "Where did they get together." Although it's debated whether the loners should be introduced to a pod, the trapped beluga made a perfect candidate for an attempt, she said. "The one last year really was because it was in distress and relocated," she said. "It was a worthwhile attempt to conduct that mini experiment." A skin sample was taken from the whale at the time of the rescue to see if it originated from the St. Lawrence River, but Wimmer said those results haven't come back yet. For a while, scientists could track the movement of the whale, which was tagged after its rescue, but the tag wasn't designed to be permanent and eventually it fell off. 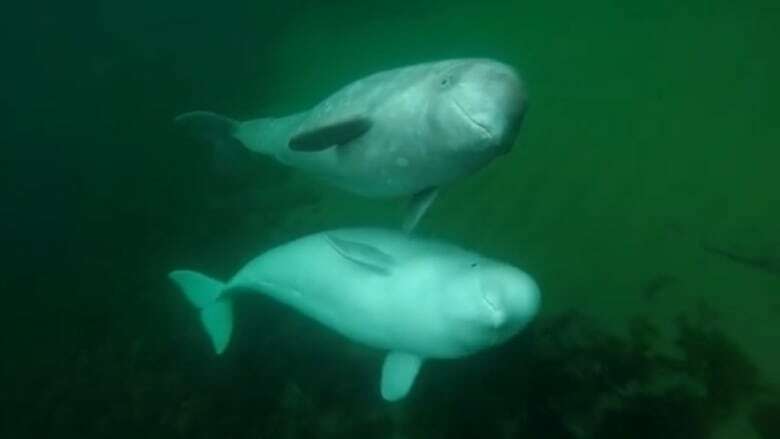 It was only when the beluga, also known as a white whale, started showing up in photos in the Cape Breton community of Ingonish this month that another researcher was able to identify it by its distinct markings. Two beluga whales have been approaching boaters and paddle boarders and become the talk of the town around Ingonish. Wimmer said it's great to know the beluga made it through the year following its rescue, but she warned against interacting too closely with the wildlife. "Keeping a safe distance is obviously in the best interest of themselves and these animals," she said.